Further rebuttals have entered the public sphere, including a joint statement from Nursing organisations including the Nursing and Midwifery Board of Australia; Australian College of Midwives (ACM); Australian College of Nursing (ACN); Congress of Aboriginal and Torres Strait Islander Nurses and Midwives and A/Federal Secretary Australian Nursing and Midwifery Federation which have also been supported by the Australian Healthcare and Hospitals Association, Public Health Association of Australia, Consumers Health Forum of Australia and National Rural Health Alliance. As CEO of CATSINaM Janine Mohamed observes in a blog for Indigenous X “Australia is playing a game of ‘catch up’”. Indeed, cultural safety is an approach developed by indigenous Māori nurses that is embedded in the undergraduate national nursing curriculum, and broadly applied across marginalised groups in New Zealand. The Nursing Council of New Zealand introduced the concept into nursing and midwifery curricula in 1992, developing the expectation that nurses practise in a ‘culturally safe’ manner. It wasn’t without resistance, however. As a nurse, academic and researcher, cultural safety has informed my professional practice. I completed a PhD which attempted to extend the theory and practice of cultural safety to both critique nursing’s Anglo-European knowledge base, and to extend the discipline’s intellectual and political mandate with the aim of providing effective support to diverse groups of mothers (Migrant Maternity). I am pleased to contribute to the conversation about cultural safety and nursing. 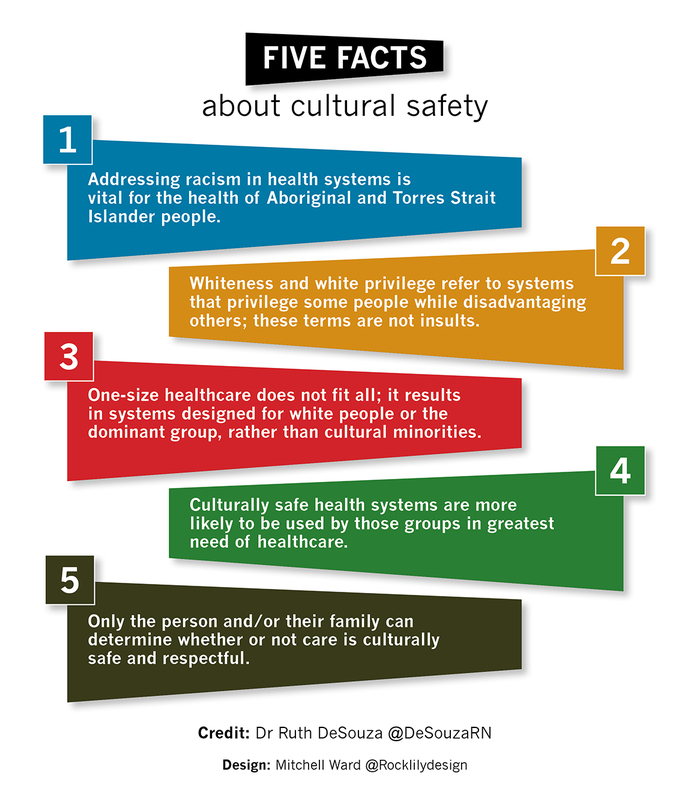 I wrote this piece called Busting five myths about cultural safety – please take note, Sky News et al for Croakey. My appreciation to Melissa Sweet and Mitchell Ward from Rock Lily Design for the terrific infographic.